Boutique accommodation Venus Bay, Victoria, Australia – Venus Bay holiday rentals, wildlife, luxury, organics, sustainable, eco friendly, solar, renewable energy, biodiversity, birds. PLEASE NOTE WE WILL BE CLOSED FROM 1 June to 31 August 2019. Venus Bay Eco Retreat offers one accommodation cottage nestled in pristine bush land on the South Gippsland coast, away from suburban areas and tourist crowds. The cottage is ideal for couples and sleeps a maximum of two adults. Please contact us using the secure email form on the Bookings & Enquiries page, or send a text message to Mae on 0439 352 538. Emails are checked daily. From the cottage you can walk or drive to nearby bird-rich wetlands at Anderson Inlet and stunning sandy beaches at Cape Liptrap Coastal Park. Wilsons Promontory National Park is 60 km scenic drive along the coast. The retreat is within easy reach of rural villages, national and marine parks, boutique wineries and slow food restaurants showcasing the diverse produce of the South Gippsland region. 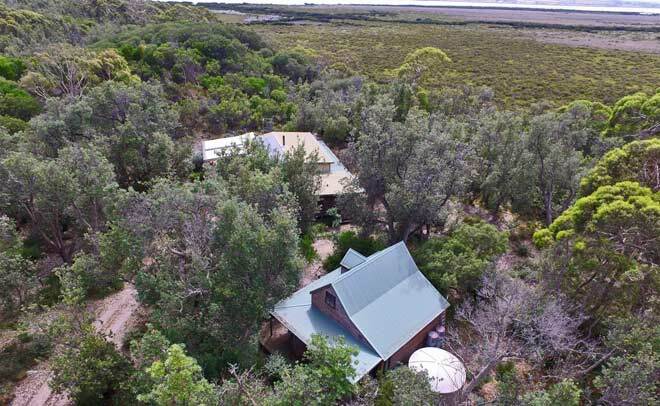 Venus Bay Eco Retreat protects 5.6 hectares of bush land managed with Trust for Nature. Your visit helps conserve this beautiful coast and the unique wildlife that live here. The owner/manager lives on site and is available to help you make the most of your stay while respecting your privacy. Thanks to the following who generously provided photographs for this website: Glenn Ehmke – BirdLife Australia; Alan Foon – Foons Photography Wonthaggi; Ian McGill, Dong Jin Kim, Rosie Potter, George Salpigtidis, Kenneth Walker, Stuart Dunbar and Colin Suggett for the property map on the Location page. Aerial view of Venus Bay Eco Retreat showing the accommodation cottage in the foreground.